There are a number of guidelines for the diagnosis and treatment of sinusitis. saline irrigation for symptomatic relief of viral rhinosinusitis; (2) recommend analgesics, topical intranasal steroids, and/or nasal saline irrigation) for symptomatic relief of ABRS; and (3) obtain testing for allergy and immune function in evaluating a patient with CRS or recurrent ARS. 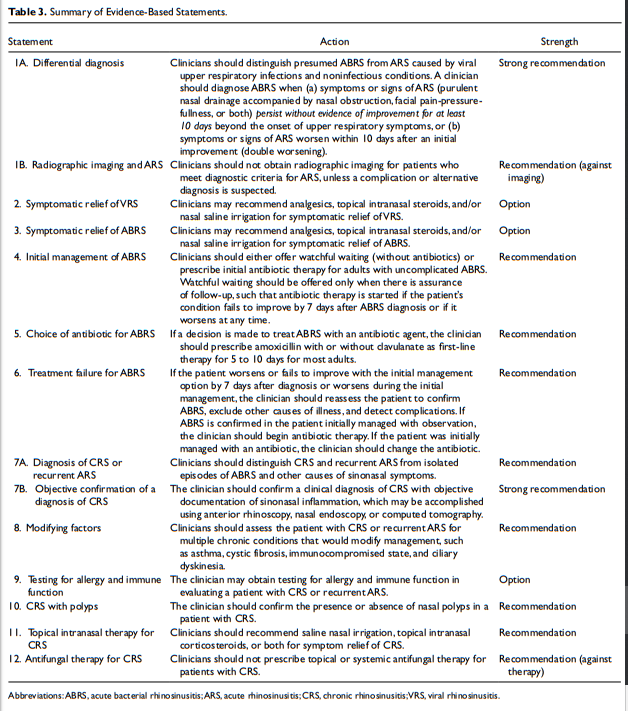 The update group made recommendations that clinicians (1) should not obtain radiographic imaging for patients who meet diagnostic criteria for ARS, unless a complication or alternative diagnosis is suspected, and (2) should not prescribe topical or systemic antifungal therapy for patients with CRS. 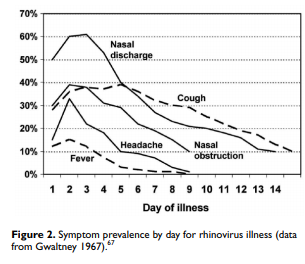 of rhinosinusitis as they were of asthma (13%). that rhinosinusitis accounted for more outpatient antibiotic prescriptions than any other diagnosis. 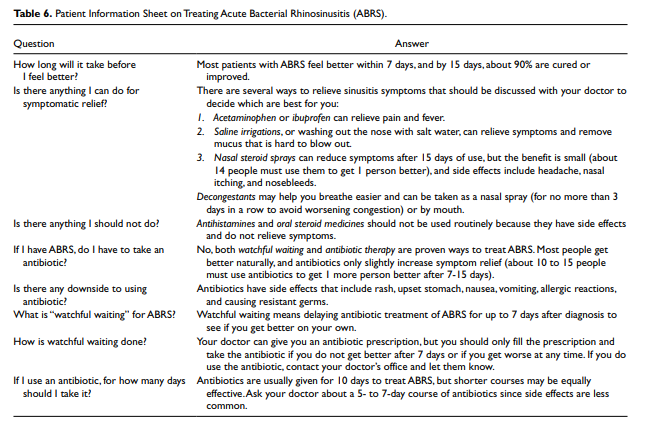 Despite guidelines that encourage judicious antibiotic use for ARS,16,19 they are prescribed in about 82% of visits.20 From 2006 to 2010, rhinosinusitis accounted for 11% of all primary care antibiotic-related visits, with ARS accounting for 3.9% and CRS accounting for 7.1%.20 ARS and CRS combined accounted for more primary ambulatory care visits with antibiotic prescriptions than any other diagnosis or commonly grouped diagnoses. 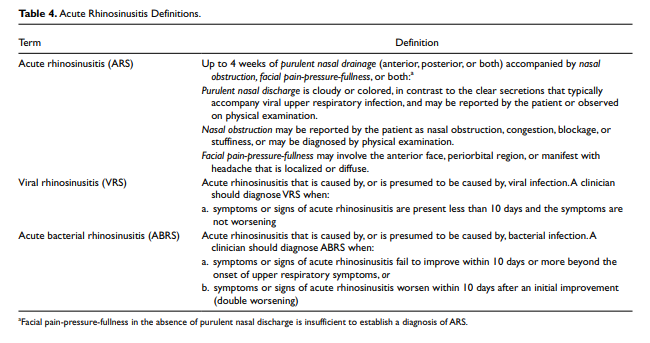 When a patient meets the criteria for ARS in Table 4, the clinician should distinguish between viral rhinosinusitis (VRS) and presumed ABRS.5,13,47,48 This distinction is based on illness pattern and duration (Table 4), because purulent nasal drainage as a sole criterion cannot distinguish between viral and bacterial infection.49 Although there is no high-level evidence showing that symptom duration and purulent discharge can reliably distinguish presumed bacterial vs viral ARS,50 the GUG considered the criteria in Table 4 to be best for this purpose based on first principles, subsidiary evidence, and expert consensus, as explained in the remainder of this section. Although ABRS is often considered a transition from a preceding viral URI,51 bacterial infection can develop at any time during the course of the illness. The concept of a transition, however, is useful for management decisions,53 especially when considering the time course of VRS and which disease patterns are most likely to be associated with bacterial infection. Although ABRS is often considered a transition from a preceding viral URI,51 bacterial infection can develop at any time during the course of the illness. The concept of a transition, however, is useful for management decisions,53 especially when considering the time course of VRS and which disease patterns are most likely to be associated with bacterial infection. of infection are presumed to have a bacterial illness. Fever is present in some patients with VRS in the first few days of illness (Figure 2) but does not predict bacterial infection as an isolated diagnostic criterion. Fever has a sensitivity and specificity of only about 50% for ABRS,52,53 and a systematic review concluded that evidence was lacking regarding the ability of fever and facial/dental pain to distinguish ABRS from VRS.68 For this reason, we did not include fever as a cardinal sign/symptom in diagnosing ABRS. Although our GUG concluded that evidence was insufficient to support a “severe” presentation of ABRS, others have explicitly highlighted this subgroup of patients with ABRS. Meltzer and coworkers13 defined a special circumstance of ABRS when purulent nasal discharge for 3 to 4 days was accompanied by high fever. “High fever” was not defined, but the criterion only applied to severe disease with a shorter duration of illness. 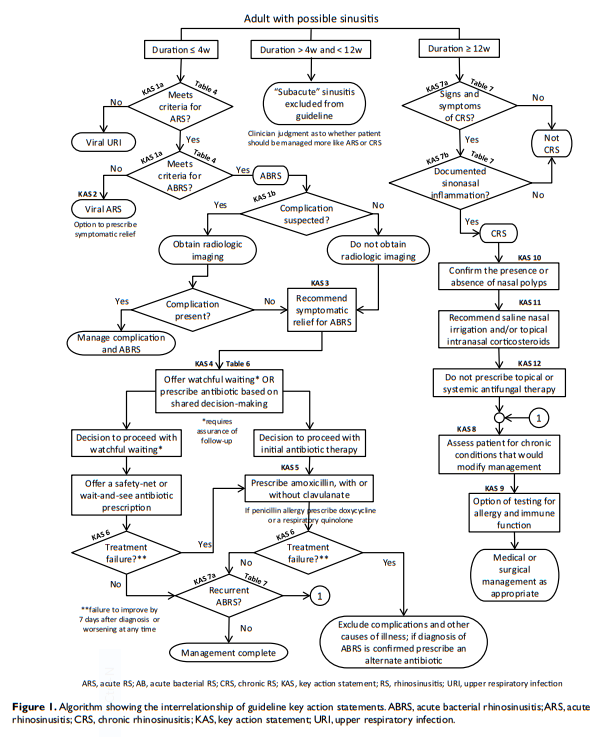 A guideline on sinusitis in children from the American Academy of Pediatrics 69 considered 3 or more days of concurrent high fever and purulent nasal discharge as a “severe” presentation of ABRS that warrants antibiotic therapy. purulent discharge or facial pain lasting at least 3 to 4 consecutive days at the beginning of illness. Clinicians should not obtain radiographic imaging for patients who meet diagnostic criteria for acute rhinosinusitis, unless a complication or alternative diagnosis is suspected. Recommendation (against imaging) based on diagnostic studies with minor limitations and a preponderance of benefit over harm for not obtaining imaging. of ABRS include orbital, intracranial, or soft tissue involvement. Alternative diagnoses include malignancy and other noninfectious causes of facial pain. Radiographic imaging may also be obtained when the patient has modifying factors or comorbidities that predispose to complications, including diabetes, immune-compromised state, or a history of facial trauma or surgery. CT imaging of the sinuses is appropriate when a complication of ABRS is suspected based on severe headache, facial swelling, cranial nerve palsies, or forward displacement or bulging of the eye (proptosis); CT findings that correlate with ABRS include opacification, air-fluid level, and moderate to severe mucosal thickening. Complications of ABRS are best assessed using iodine contrast-enhanced CT or gadolinium based MR imaging to identify extra-sinus extension or involvement.33,75-77 Suspected complications are the only indication for MR imaging of the paranasal sinuses in the setting of ABRS. CT scanning, which offers advantages of point-of-care testing and possible decreased radiation dosage. The indications for office-based CT imaging are the same as for traditional scanners, and they should not be used for diagnosing or managing uncomplicated ABRS. complaints), but the authors conclude that additional research is needed for adequate confidence in the true effect of systemic steroids. The above article has been cited in 62 PubMed Central Articles. (2) Diagnosis of acute rhinosinusitis in primary care: a systematic review of test accuracy [PubMed Abstract] [Full Text HTML] [Full Text PDF]. Br J Gen Pract. 2016 Sep;66(650):e612-32. doi: 10.3399/bjgp16X686581. Epub 2016 Aug 1. (3) Necessity of office visits for acute respiratory infections in primary care [PubMed Abstract] [Full Text HTML] [Full Text PDF]. Fam Pract. 2016 Jun;33(3):312-7. doi: 10.1093/fampra/cmw019. Epub 2016 Apr 5. (4) Is Rinsing Your Sinuses With Neti Pots Safe? from The U.S. Food And Drug Administration. This entry was posted in Ear, Nose, & Throat, Family Medicine, Infectious Diseases, Internal Medicine. Bookmark the permalink.